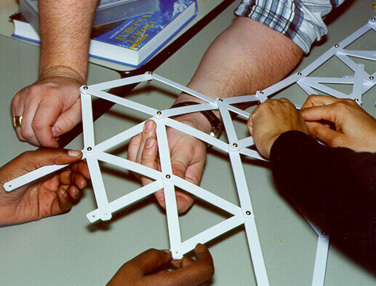 Following is a snapshot of the Bridge Game exercise and the many opportunities of learning during each of the phases. Up to 5 teams competing to build a bridge of high standards and within critical time constraints. Working in a very competitive setting, while dealing with many unanticipated outside influences. Ideally, the class is divided into (max.) 5 teams placed at remote workstations, mixing participants in order to break up clusters of ‘buddies from work’. Remember, we’re trying to build some new partnerships, and let’s see how quickly they can do that. There are three consecutive phases, each of them geared to hone some specific traits. Developing: Leadership, Communication, Partnering, CRM. All teams receive identical materials, instructions and diagrams on which to base their bids. Within each team, members introduce themselves and then elect a Project Leader from within. After developing their strategy, a time estimate is calculated and submitted as a secret bid. As the bid times will be all over the map and unreliable, all teams are given a chance to build their bridge. The first one ready and passing inspection will be accepted. Just watch them scramble ! Developing: Leadership, Team Work, Delegation, Self Empowerment, CRM. The building phase is loaded with true-to-life interruptions, including a major surprise engineering change, and you couldn’t come much closer to a real-life business scenario. The building phase is filled with high energy activity, allowing team players to be themselves, and everybody always has some good productive fun with it. This phase offers excellent opportunities for self evaluation as team members recognize their failures while celebrating their positive achievements and partnerships made. A complete set of instructional guidelines is provided to assist you in conducting a thorough debriefing. 2.0 Hours… and beyond, if you have the time. The Bridge Game is loaded with features, and we suggest that you use what you can while you have your teams together. Running time depends largely on how much you want to get out of this exercise, your specific objectives as well as the number of participants involved. While each team has only one leader, every team player is encouraged to demonstrate their own leadership traits. The exercise gives them every opportunity to do so. CRM (Customer relationship Management) is another crucial component that is continually challenged in this project. Participants will soon learn that if the client is not an active part of their plan, they are missing their best partner. We would be hard-pressed to find a more powerful ‘Team Builder / Ice Breaker’ for mixed audiences, involving people from remote or otherwise unrelated areas of the business. Team Synergy is quickly established as team players lean on each other’s strong traits to get through an array of challenges popping up from everywhere throughout the entire exercise. Some subtle disarming of the ranks will soon show its effects. It opens the communication lines between all participants for some quick bonding. It also levels the playing field, giving everyone an equal chance and the courage to fully participate. Participants from all management levels will find their own strengths and weaknesses in Virtual Teaming Skills across Managerial Boundaries.